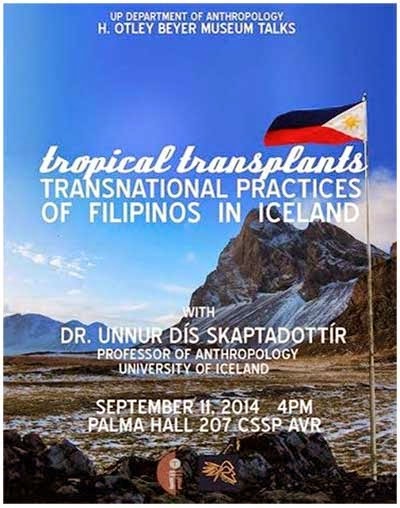 The H. Otley Beyer museum talks on “Tropical Transplants: Transnational Practices of Filipinos in Iceland,” held last September 11, 2014 in Palma Hall, CSSP AVR, by Icelandic anthropologist Unnur Dís Skaptadóttir, is enriching both on the discourses of transnational human migration and ecological adaptation. In the said talk, there are many common issues discussed by the speaker about Filipinos in Iceland and when compared to other Filipino diasporic communities abroad in her cross-cultural observations. But what interest me most about the recent dialogue, is the fact that, Filipinos in Iceland are starting to make waves in terms of their identity and culture manifested through labor skills, food and business, and their imagined community. Surprisingly, given Iceland’s remote location for Filipino diaspora, it is no joke that Filipino community is omnipresent even in this Nordic country between the North Atlantic and the Arctic Ocean. Filipinos are the newest tropical transplants in the cold and frigid country of Iceland. But what are the transnational practices of Filipinos in Iceland that may create unity or disparity among the multi-layered and multi-sited transnational social fields embedded in Iceland’s society? In the case of the Philippines, migration to Iceland has been extensive as it maintained export of labor to sustain its economic development strategies since 1970s. What is supposed to be a temporary solution to the economic woes of the country back then became profitable in the succeeding decades for our government that even today the welfare of the Overseas Filipino Workers (OFWs), proclaimed as the new heroes, is institutionalized through a government agency (POEA/OWWA) overseeing them. Hence, the welfare of OFWs worldwide has been one of the core interests of our country when it comes to national security. One of their rights is to allow them to acquire dual citizenship and the right to suffrage, in which Filipinos in Iceland are enjoying since diplomatic ties between the two countries formally established in 1999. Given the economic and political scenarios of Filipino migration to Iceland, now that they are part of the larger multi-cultural Icelandic society, what were the cultural differences between Filipinos and the Icelanders based from my reflections to the talk of Dr Unnur Dís Skaptadóttir? 1. Historical particularism (colonial experience) - decades ago, only few people live in Iceland had foreign citizenship. It used to be a poor country colonized by the Danish, Norwegians, and Germans. In spite of colonization, it maintained its ‘individualistic’ and westernized European image. Since then, there has been a large increase of immigrations from Europe but only recently from Asia. However, one participant in the forum compared the colonial experience of the Philippines from western countries including Spanish and Americans to Iceland, and wondered how come Filipinos did not become like Icelanders (i.e. individualistic)? The speaker tried to compare the differences of Northern Europeans to southern Europeans which would tell about the nature of societal and cultural differences. But for me, even if the Philippines were colonized by western powers, it remained Asian in norms and customs; communal in orientation in various social and cultural patterns manifested in the organizations of family, society, and people. 2. Familistic Orientation (padala/remittance system and the Filipino upbringing) – the concept of the remittance or the padala system among the Filipino community sounds strange for many Icelanders. They couldn’t believe that Filipinos are working so hard and send partial or whole of their savings to their nuclear or extended families in the Philippines. 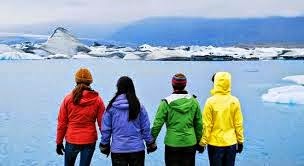 Since Iceland is an individualistic society, they have certain western values. On the other hand, there are cultural differences when it comes to upbringing. Since most of the times, sunlight is prominent even at night, Filipino parents would impose curfew to their adolescent sons and daughters, while adolescent Icelanders are liberal when it comes to their time management. It also goes with ecological reason because at midnight the air and weather is swift that’s why Icelanders usually play or hang out until midnight. But for Filipino families, they would still impose the same kind of time management they have acquired in the Philippines with their adolescent sons and daughters transplanted in Iceland. 3. Identification Card – Filipinos at first had mistrust in the use of identification card or ID when they migrated in Iceland. But the use of ID is intended for national security in Iceland given to their citizens with many perks alongside, especially in their day to day lives for subsistence used in transportation, groceries, and schooling. That’s why when they go back to the Philippines, they find strange that many Filipinos in the Philippines are not amenable to the implementation of the national identification card system for safety and security. 4. Effects of Economic Recession to the Filipino Community – in 2008 until 2011, Iceland suffered its heaviest economic woes. The financial crisis that involved the major collapse of its banks has caused the government to slash employment due to budget deficit. Recruitment of OFWs in the health sector like nurses and medical doctors were halted. But right after recuperating from the financial crisis, OFWs were sent again to Iceland, mostly in mining and health sectors. 5. Open Migration – Filipinos are the largest Asian population and the sixth largest among foreign nationalities in Iceland. Filipino migration in Iceland is spread through word of mouth, especially among first generation Filipinos who are diplomats, nurses, and doctors. Some live in the capital city but most reside in rural places operating their own businesses like restaurants and groceries. Although they have food businesses, Filipino food is not prominent unlike Thai, Japanese and Korean deli; or sometimes they own Asian restaurants. There are some Filipinos who are also now popular in the Icelandic society given their contributions to its intellectual, economic, and socio-cultural make-up.